The Amazon and Cerrado regions are the main sources of agricultural commodities and greenhouse gas emissions (GHG) in Brazil, especially from cattle ranching and soybean. Production of both beef and soy is expected to increase in the country by 2030, with a possible impact on the Brazilian Nationally Determined Contribution (NDC) to the Paris Agreement. 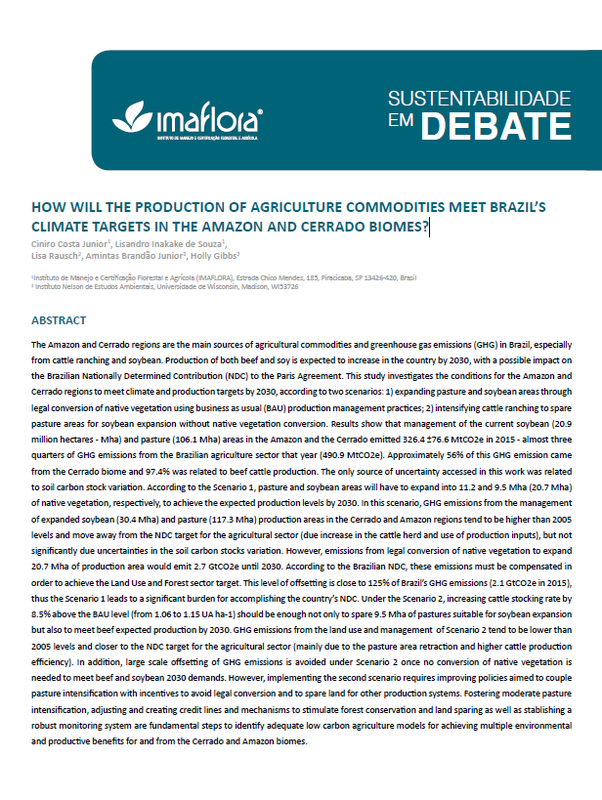 This study investigates the conditions for the Amazon and Cerrado regions to meet climate and production targets by 2030, according to two scenarios: 1) expanding pasture and soybean areas through legal conversion of native vegetation using business as usual (BAU) production management practices; 2) intensifying cattle ranching to spare pasture areas for soybean expansion without native vegetation conversion. Results show that management of the current soybean (20.9 million hectares - Mha) and pasture (106.1 Mha) areas in the Amazon and the Cerrado emitted 326.4 ±76.6 MtCO2e in 2015 - almost three quarters of GHG emissions from the Brazilian agriculture sector that year (490.9 MtCO2e). Approximately 56% of this GHG emission came from the Cerrado biome and 97.4% was related to beef cattle production. The only source of uncertainty accessed in this work was related to soil carbon stock variation. According to the Scenario 1, pasture and soybean areas will have to expand into 11.2 and 9.5 Mha (20.7 Mha) of native vegetation, respectively, to achieve the expected production levels by 2030. In this scenario, GHG emissions from the management of expanded soybean (30.4 Mha) and pasture (117.3 Mha) production areas in the Cerrado and Amazon regions tend to be higher than 2005 levels and move away from the NDC target for the agricultural sector (due increase in the cattle herd and use of production inputs), but not significantly due uncertainties in the soil carbon stocks variation. However, emissions from legal conversion of native vegetation to expand 20.7 Mha of production area would emit 2.7 GtCO2e until 2030. According to the Brazilian NDC, these emissions must be compensated in order to achieve the Land Use and Forest sector target. This level of offsetting is close to 125% of Brazil’s GHG emissions (2.1 GtCO2e in 2015), thus the Scenario 1 leads to a significant burden for accomplishing the country’s NDC. Under the Scenario 2, increasing cattle stocking rate by 8.5% above the BAU level (from 1.06 to 1.15 UA ha-1) should be enough not only to spare 9.5 Mha of pastures suitable for soybean expansion but also to meet beef expected production by 2030. GHG emissions from the land use and management of Scenario 2 tend to be lower than 2005 levels and closer to the NDC target for the agricultural sector (mainly due to the pasture area retraction and higher cattle production efficiency). In addition, large scale offsetting of GHG emissions is avoided under Scenario 2 once no conversion of native vegetation is needed to meet beef and soybean 2030 demands. However, implementing the second scenario requires improving policies aimed to couple pasture intensification with incentives to avoid legal conversion and to spare land for other production systems. Fostering moderate pasture intensification, adjusting and creating credit lines and mechanisms to stimulate forest conservation and land sparing as well as stablishing a robust monitoring system are fundamental steps to identify adequate low carbon agriculture models for achieving multiple environmental and productive benefits for and from the Cerrado and Amazon biomes.